Last day at school for Anna Sophia Walbeck (Eaton Hernis Scan Systems), Linda Hye (University of Agder), Bjørn Viken (National Oilwell Varco Norway), Jeffrey Roberts (KSMV), Bjørn Saltermark (GCE NODE) and Gøril Hannås (NOV/University of Agder), as GCE NODE’s supply chain management course comes to an end. The first supply chain management course scored big among participants. “Based on interest and feedback from the 2015-course, we are likely to offer a 2016-course in supply chain management”, says Bjørn Saltermark, project manager at GCE NODE. 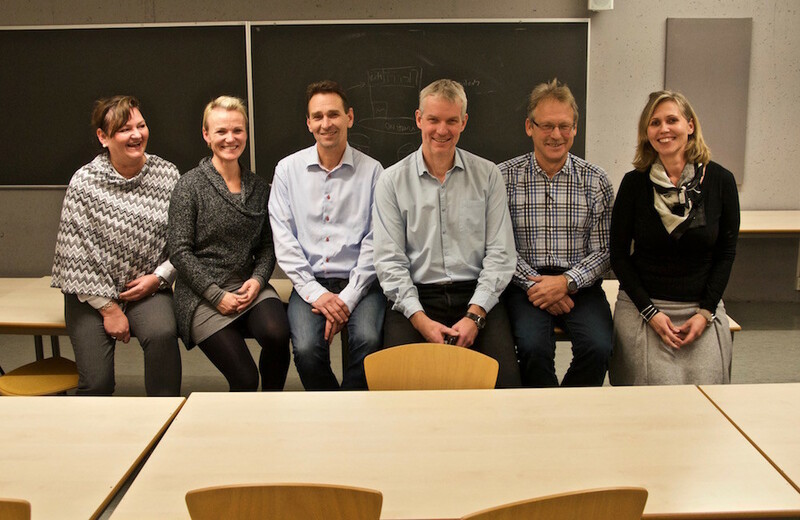 28 participants from 14 NODE companies completed the course at the University of Agder in November 2015. Almost half of them have took an exam, as a step towards a Bachelor’s or Master’s degree, depending on which level the candidate enters. “I have been looking forward to every session. I haven’t missed any! I found the lecturers both knowledgeable and inspiring. This is something I want to spend the rest of my career doing”, says Anna Sophia Walbeck at Eaton Hernis Scan Systems. “I gained new and useful knowledge. The course was designed to work independent of company size. I believe the course was of just as much value for the NOV team as for any participants from SMEs”, says Bjørn Viken at National Oilwell Varco Norway. Jeffrey Roberts at KSMV concurs. “In a small company like ours, we are full-time engineers at daytime and part-time buyers at night-time. This has been enlightening, says Roberts. The supply chain management course is part one of GCE NODE’s three-part Cluster Development Program. The next two stand-alone parts are Research, Development & Innovation and Internationalization. RD&I will presumably start in the late spring or early fall of 2016. The Cluster Development Program is funded by Sørlandets Kompetansefond, Innovation Norway, Listerfondet and Lindesnesfondet.